The Stage Wash series includes three fixtures of varying sizes, each utilising powerful 1 watt red, green and blue LEDs, which can be combined via RGB mixing to produce thousands of rich, smoothly blended, colours. Using a DMX controller, virtually any colour or hue imaginable can be created. A 0-100% Electronic Dimming feature lets users fade and adjust the intensity of colours, while a Speed Adjustment feature provides control over fast-to-slow colour changes. The compact Stage Wash 18 is the first fixture in the new range, which incorporates 18 LEDs. The larger Stage Wash 36 makes use of 36 LEDs, while the series is completed by the Stage Wash 54 that utilises 54 LEDs across a lighting batten with a length of just over half a metre. All of the units in the range are fitted with hanging brackets and can be hung from a lighting rig or mounted on the floor to act as up-lighters. With several operating modes to choose from, the Stage Wash series can handle a variety of applications. They can run in DMX mode to create customised light shows and can also be operated in several modes that do not require an external controller: Auto Mode (running through internal programmes), Sound Active Mode (chasing to the music), Colour Fade (cross fading colours), Colour Change and Static Colour modes. Additionally, multiple units can be linked together Master-Slave. 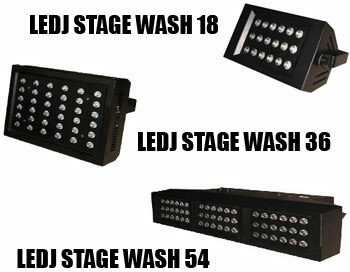 The LEDJ Stage Wash units are available now from retailers nationwide.